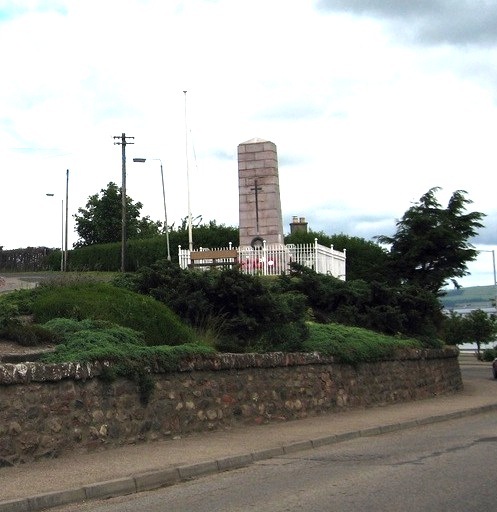 The Monument is a pillar of reddish granite, without a cross, and similar to a small Cenotaph. About half a metre from the top there is a band of a celtic-type design. On the side facing down the High Street, there is a large bronze sword with a palm-like frond on either side. Under the sword is a bronze wreath. There are no names on this side of the Monument. Well-placed for visibility at the east end of High Street, and at a road junction with Seabank Road. See link on navigation bar at foot for the HMS Natal disaster. Map Reference is NH714 687 on Sheet 21. NOTE: the names and initials are as on the monument and have been checked.